An interview with director Robert Alvarez. Listen to Robert’s two part interview here and here. Director & artist Robert Alvarez is one of the great ones, and incredibly important to me (and Frederator). 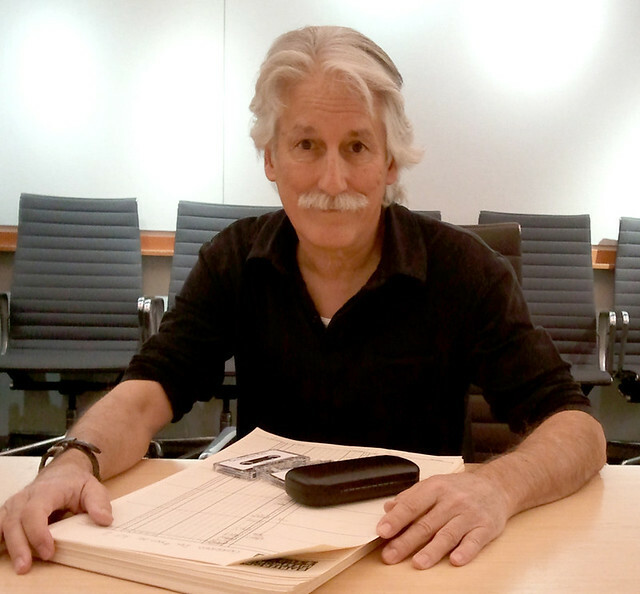 So I was very pleased to listen to the oral history interview posted this week by feature film writer Steve Hulett of Hollywood’s Animation Guild. As you can hear in the interview, Robert’s wanted to be in the cartoon biz since he was in the 8th grade, he succeeded in getting into the industry very early, and he’s been a thriving, creative stalwart for over 40 years. His imdb page has its first credit as 1969’s animated Winky Dink and You, and he’s worked on the full range of projects from The Smurfs to Samurai Jack (where he got his first Emmy®) right through to Regular Show. You really can’t keep a good man down. Every new generation of talent is eager to make their own mark on the business and looks skeptically on the people who came before them, as if they’re somehow not good enough for their masterpieces. After initial doubts, Robert has won over every new group of creators that have invigorated cartoons for the almost 20 years I’ve known him. He’s done it with his skills, certainly, but it might be his patience, excitement, and generosity that have most triumphed. 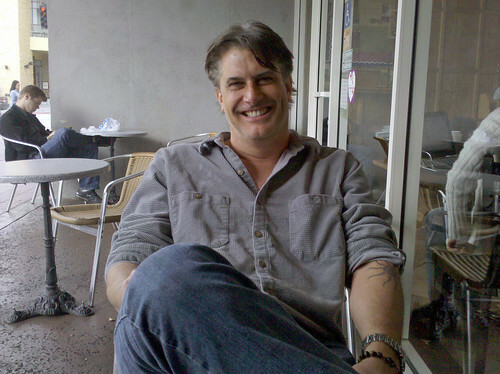 I want to put in a word for the Animation Guild and its Business Representative Steve Hulett too. There’s probably no institution more dedicated to keeping show business animation alive than the Guild (no, not Disney or Pixar), and Steve’s right at the front of the line. I was once a Doubting Thomas having grown up throughout my life in management (my parents owned their own business, and I’ve been running companies for quite a few years) and having had a few particularly unpleasant run-ins with a past Guild president. But, now I send every single new Hollywood animation arrival straight over to Steve. I know he’s there to make everyone’s entry into the industry as smooth and productive as possible, and that the Guild runs classes and events designed to broaden everyone’s skills and networking possibilities. They’re a bunch of solid citizens over there, and I encourage everyone with an interest to check out their site and blog as often as possible. We’re all indebted. And I love these oral histories, four of which are posted on the blog now. Keep ‘em coming Steve, we’re all waiting. 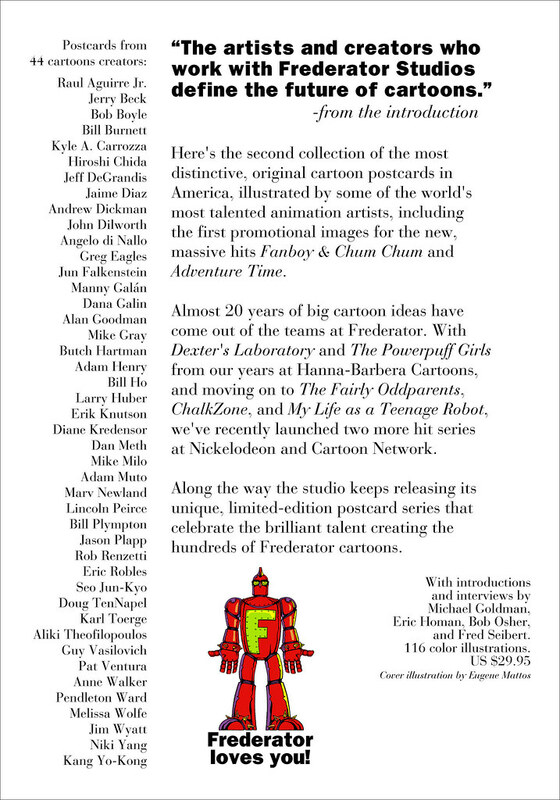 OK, here ’tis on Amazon.com, Original Cartoon Title Cards from Frederator Studios, before Christmas, as we hoped. Not sure if they can actually deliver it by next week, but you can check. The official release date is in March, so at least you can get a head start on everyone else. In the meanwhile, you can preview the whole book below to see if it’s worth it to you. Please, consider the unconsidered art of the original cartoon title card. For almost a century, the art of the cartoon title card has not been disparaged, disregarded, or dismissed. It has been completely ignored. And by the 1970s it had almost completely disappeared. Over 200 full color original title cards from hit Frederator cartoon series, including The Fairly OddParents, Wow! Wow! Wubbzy!, Fanboy & Chum Chum, Adventure Time, and eight more. If you’re looking for some of the best reading to be done from the inside out of the animation industry, you’d do a lot worse to check out all of Dave’s library, from how to break into and thrive in the business, to getting a show on the air. Chris, Jesus, and Ryan @ the red couch. Our crack Wow! Wow! Wubbzy! 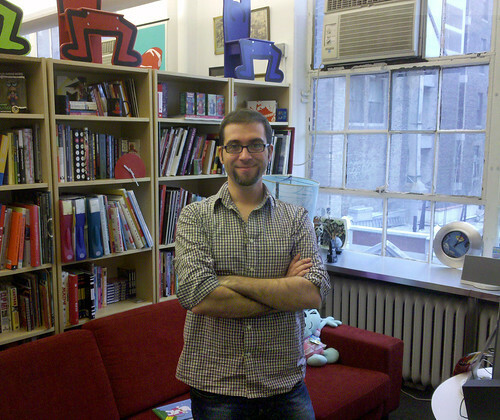 from two summers ago, Ryan Charmatz, stopped by Frederator/NY yesterday. He was cutting animation class at SVA (just down the block from us) along with school buddies Chris Wagar and Jesus (Jesus didn’t email me his last name; I think he’s like Madonna). Update: Jesus Sanchez! 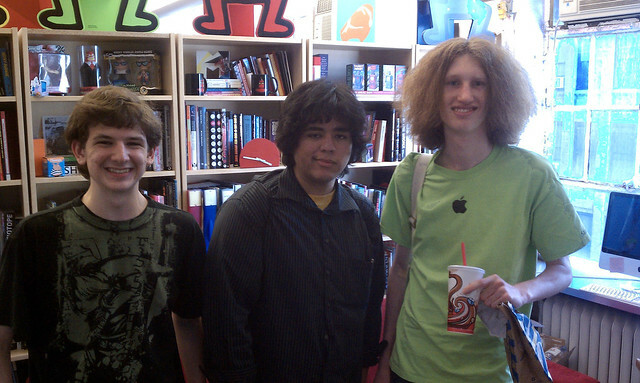 It was great seeing all of them rockin’ in New York and starting off the next phase of their animation career. I’m sure they’ll all be back soon. Salesman Pete Trailer from Salesman Pete on Vimeo. It’s a cloudy, humid day in New York, and this morning it seemed like it would be business as usual at Frederator East. Phone calls, meetings, lunch, more calls and meetings. Now, in the cartoon biz, that ain’t bad. We’re skimming oil from the Gulf here. And then an email arrives from our friend, illustrator/animation director David Cowles, with a link to this trailer. “Man, those French animation students…” says David. He’s talking about Anthony Vivien, Marc Bouyer, and Max Loubaresse. Watch out, you’ll be hearing from them. Just when you least expect it, talent rears its ugly head. Bad-guy turn from Salesman Pete on Vimeo. Pete turn from Salesman Pete on Vimeo. WIP du premier plan du court Salesman Pete from Salesman Pete on Vimeo. Plan 25 WIP from Salesman Pete on Vimeo. 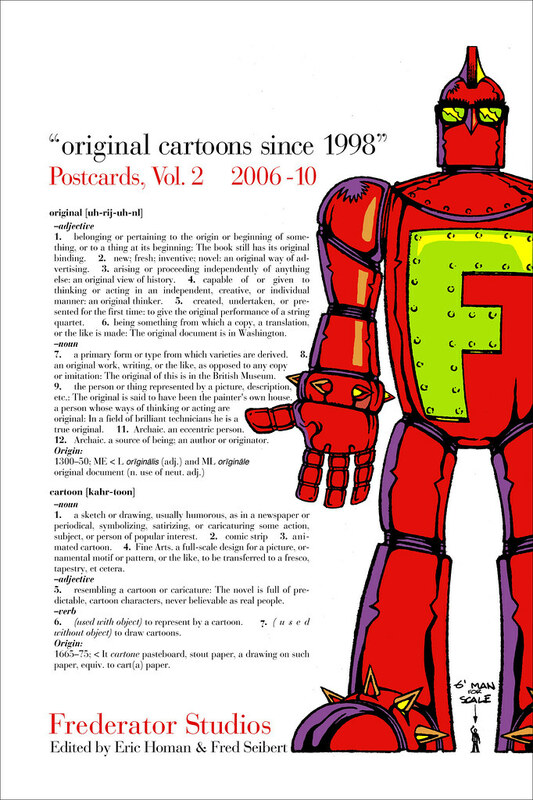 It took a while to get the gallies right, but the second collection of Frederator’s postcards is available over at Amazon.com (the first one’s there too). Eric Homan is our resident postcard collector, but that’s not the main reason he has an insightful interview here. Entertainment journalist Michael Goldman wanted to get the scoop on how Eric developed the last round of big ideas in our Random! Cartoons shorts incubator, including the background on Fanboy & Chum Chum and Adventure Time. Their cards, and all 39 of the original Random!s, are included in the book. And that’s not all! 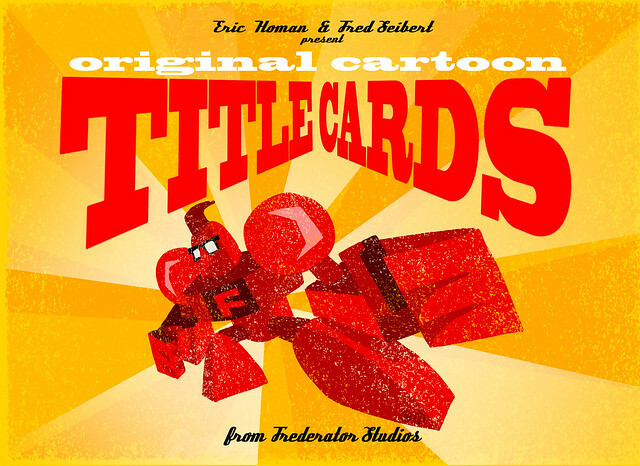 The complete postcard series 6 through 9 are here, including the black & whites, and the History of Frederator set. And, the non-series Wow! Wow! Wubbzy! collectibles that were made for the International Licensing Shows, and a bunch of stragglers that were produced here and there over the years. Plus, a preface by the guy we work for at Sony Pictures Animation, Bob Osher, and a short introduction from moi. 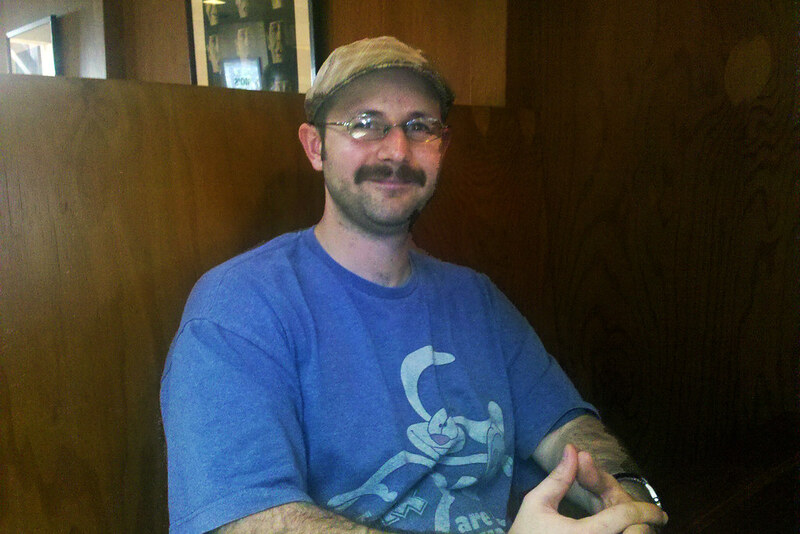 Bobby Miller –webstar, filmmaker, and Channel Frederator manager– introduced me to his childhood bud and fellow filmmaker Nick Bertonazzi. We met at Mo’s in Burbank, California the other day and traded tales of animation in New York and Hollywood, and he gave me a little insight on The Ricky Gervais Show, where he’s been the lead animation director. Great meeting you bud. Tomm Moore @ the red couch. Frederator/NY was honored by the presence of an honestly won Oscar nominee this morning, when “Secret of Kells” director Tomm Moore stopped by to get acquainted. We met briefly at the Annies last month, but he’s been so booked up with people wanting to kiss his ring that it took a while for us to have a few minutes peace. Like his Cartoon Saloon partner Paul Young, who gave us our first preview last summer, Tomm embodies the independent spirit of talent and ideas we all would hope gets the top nods in the movie biz. There are great things in store for everyone at the Saloon, so keep watching for them, they’ll constantly surprise and amaze you. Check out a bit of “The Secret of Kells” here, before buying your theatre tickets. The Secret Of Kells - This Is My Forest-Uncom from Cartoon Saloon on Vimeo. Joe Murray @ The Coffee Bean. It’s kind of hard to believe that I’d never met Joe Murray, creator of Rocko’s Modern Life and Camp Lazlo, but there you go. Our friend Khaki Jones put us together yesterday and we started getting to know each other at The Coffee Bean & Tea Leaf in beautiful downtown Burbank. It was a great first step because, at least for me, a conversation is usually the first step to figuring out work to do together. Nice meeting you Joe (and thanks Khaki). Kevin Lofton & Fab 5 Freddy in the house. 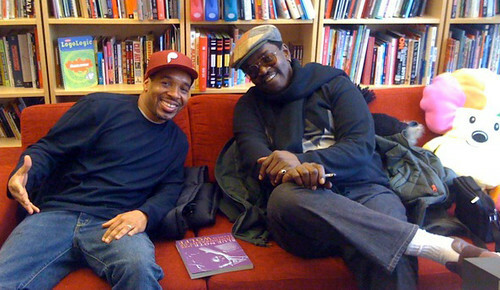 Animation director Kevin Lofton was back at Frederator/NY, and this time he brought a special guest star, hip-hop pioneer Fab 5 Freddy. We were all discussing feature projects, and maybe we’ve just about got one. Thanks for coming over guys.